It's time for another Shortcut Quilt! 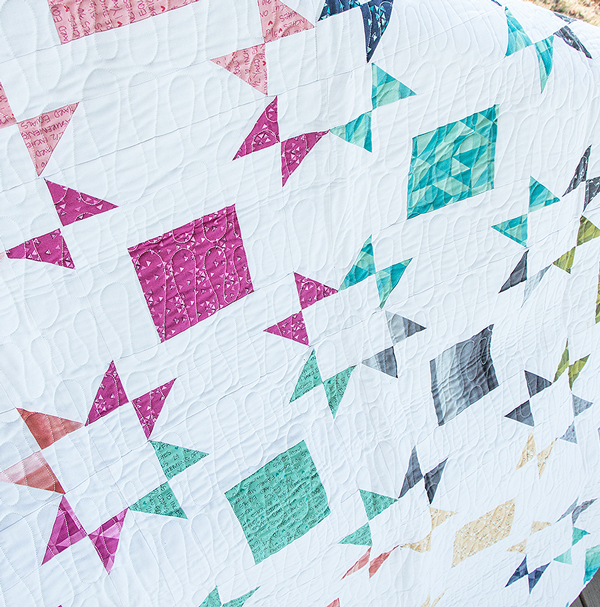 Today we have a fun quilt along featuring a new, free pattern - Layer Cake Pop! This quilt pattern is a delight to make and we just love those cheery pops of color throughout! 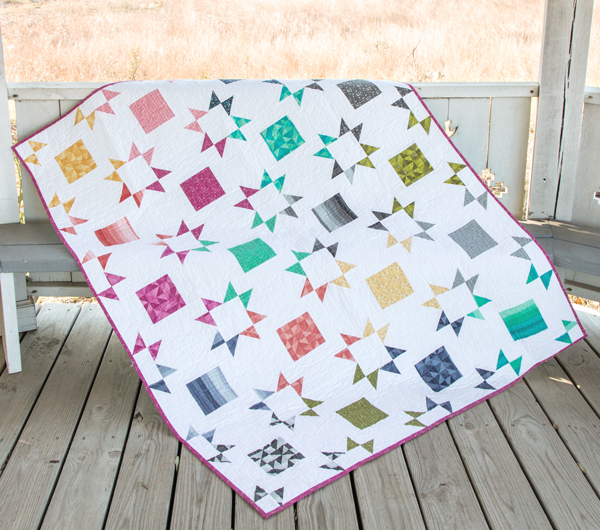 This beautiful quilt kit features the charming and vibrant prints of Spectrum by V & Co. Perfect your finished product with the bright teal backing set! It's time to get to quilting! Follow along as Kimberly walks you through this pattern step by step! Wasn't that fun?! Leave a comment on this blog post of your favorite notion used in the video, and be entered to win a $25 gift certificate to Fat Quarter Shop! Contest will end January 28, 2017! We have some fun quilty friends along for the journey! Check out their blogs to see the free Layer Cake Pop pattern in a variety of fabric collections! *Disclaimer: Discount only valid on regularly priced layer cakes. Offer valid January 26, 2017 through January 28, 2017. One use per customer. LOVE the Frixion pens. Use them all the time. They are by far the best brand that I have used. Alphabities are super helpful in staying organized! I would love to have one of those Frixion pens! I've been waiting for one to pop up in my Sew Sampler box! Aurifil thread! It's the only thread I use! The iron looks awesome...is that a notion?? Lol. I need a new one so I notice them! Pens are always important so the pens too! I agree on the iron! I do not like the one I have right now and have heard good things about reliable!! I love my small ruler! I like the Cut and Press! It's so handy! Very cute quilt! I love the rulers! So many useful sizes! Love the frisson pen! Use it for all my markings. I love the Quilters Cut and Press mat. Mine ha been used so much, it's almost worn out. I really like the frixion pena! I am intrigued by the friction pen I have never used one. I love aurifil thread-it sews like a dream! I love the frixion pens - I always give one to my secret sister! I really like the Alphabitties. I get lost or forget what piece goes where so these keep me orderly. The Cut and Press mat-I have one and it's so useful! I love aurifil thread most. The next item would be the frixion pen. Awesome. Thanks for pattern and tutorial! I love my creative grids 4.5" ruler - I use it for everything!! The Creative Grids ruler is my favorite -- use this all the time. Alphabitties are my fav. I use them all the time! I use Frixion pens all the time! Love the Aurifil thread! Creative grids rulers are the best! Too many to pick one favorite. I love the Tula Pink shears! I keep hearing about Frixion pens, and I would love to try them. This quilt is such a clever design! Thank you for this offer. Love the frixion pen!! Off to download the pattern now!! The Frixion Pen is always nearby when quilting. I love the ruler - I don't have one that size and it would be great! I don't have any alphabitties but they look so cute and practical. I'd love to use them. I need to purchase one of those quilt and press mats! That would be a time and space saver! I would have to say the alphabitties! I use them for every project! The Alphabitties! I have 3 sets and use them all the time. Frixion pen is the only marker I use...never fails! Like you, I use a Reliable iron and love it! I've had mine for several years now and the only iron I use! Thank you for the pattern! I love those Alphabilities. So useful. I think my favorite is the little 6inch ruler! I've been using mine since I bought it! So useful. I like the rulers. I really do not have a good one. All I use is Aurifil thread. It never fails. I really like the ironing mat. The Quilter's Cut & Press looks like a handy thing to have. I love the press and sew mat. I would love to try a Frixion pen! I also really like the small ruler, and need to get one for myself. I really Ike the rotary color and small ruler. I do a lot of small quilts and that is the ruler I seem to reach for the most. Tula's scissors and Frixon pen! I like the aurafil thread! Thank you so very much for sharing another great shortcut pattern, I have used a number of them! I was excited to see the the links to look at other versions, but most of them have no mention of this new pattern and no version to see. Love the Frixion pen; it helps me as a beginner in so many ways. Auriful thread is my favorite notion. Thanks for a great pattern!! I love the Auriful thread. You can find any color you need to match any project your working on! Thanks for the pattern! Mine has to be the Aurifil thread! I would love to try that Frixon pen! I love Aurifil #2024. Aurifil is so reliable, and 2024 is one of my favorite colors for piecing. I have to say my Creative Grids/Fat Quarter Shop 2.5 x 6.5 ruler! I use it every time I work with jelly rolls! So many favorites! I am addicted to Aurifil thread Creative Grids rulers! I can't live without them, lol. Thanks for the cute pattern, and the chance to win! The friction pen is awesome. I like the little alphabet letters used to "label" fabric pieces. I have not seen them before. I am addicted to piecing with Aurifil thread! It never lets me down! I like the heavy scissors! I love the small Creative Grids ruler! I own 3 in this size so I can have one handy at all times! I use all of those notions, but my favorite is the Frixion pen. Very nice quilt patter too! Oh! I need that cut and press 2 that Kimberly is using! i love aurifil thread. thanks for the cute pattern and video. Thanks for this chance. I love my Reliable iron! Love the cut and press mat. The pattern would make a great little baby quilt. I like my frixion pens. I like the pen that the mark disappears. I love Aurifil thread the most! Love the Velocity Iron...that's a notion right? LOL. I like the frixion pen and the cut and press mat both! I can't get along without them! It would be handy to have a Cut n Press board! I love the frixion pen. I keep eyeing the Cut and Press mat! I got a Frixion pen for Christmas, and have been having a ball using it. Am I a sewing nerd or what--LOL! I LOVE IT! Thanks for the new pattern...I can't wait to look through my stash and start cutting it out. Love those Frixion pens, they are the best!!! I love the Aurifil threads. They are awesome to work with. I love my frixion pins. I love the Frixion pens! Just a rotary cutter! I remember way back when having to make templates in cardboard, cut them out, trace them onto the fabric and cut with scissors! I LOVE Alphabitties! They are the perfect quilting companion! Can't do without the Frixion pens! Or the Aurifil thread! Thank you for the great pattern and video. What a great pattern. I enjoyed seeing all the different options made by the bloggers. My favorite notion is great thread. I've just started using Aurifil thread and it's wonderful. I love the Alphabets. Looks like they would be useful on any block with multiple pieces. I love the ruler so small and tiny. Creative Grids/Fat Quarter Shop 2 1/2 x 6 1/2 Ruler . This is now on my to buy list. Aurifil thread is my favorite! ok I don't know what those letter things are but I'm sure I need them! I have to say the Aurifil thread. 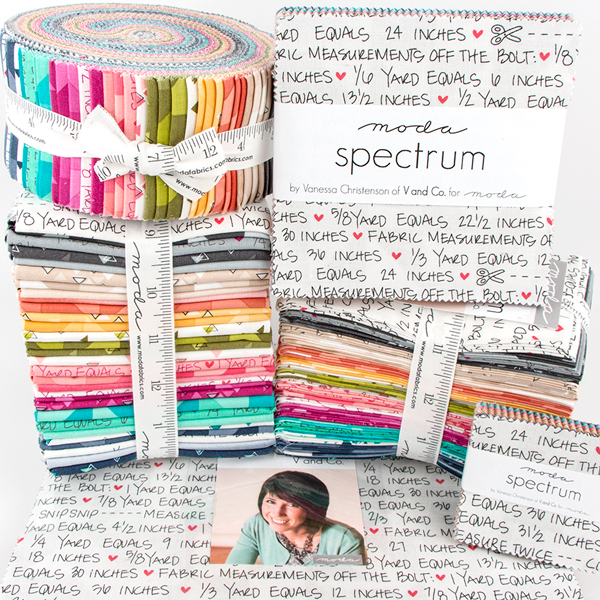 Loving on Aurifil threads! !! Those alphbitties always intrigue me. I think I need to add some to my notions. Thanks! I have fallen in love with Aurifil thread, especially in free motion quilting on my domestic machine! Thanks for a beautiful pattern and great video tutorial. I am on the bandwagon with the Aurifil thread also. I love it and so does my machine. This is a cute, fun, and fast quilt. Love it! I like the little ruler, and the fun coloured scissors! I like the small ruler for working with the smaller squares -- both for drawing lines and for cutting the corners off after sewing. Love the cut and press mat. Frixion pens are my friend! LOL They truly make it easy to mark, then erase with an iron. Love the video! I love the rotary cutter! Love the quilt, so cute! and I love the frixion pens, so handy. My favorite notion used in the video is the Frixion pen. Love the notions used in the video, but my favorite is possibly the Frixion pen. Love to use it for embroidery marking, applique and more. wonderful tool and product. Recently Discovered Frixion pens and I love them! I love the Tula Pink scissors! Alphabities are so fun to use! And keep me organized! Alphabitties! Thanks for the chance to win! My favorite notion in the video is the friction pen. I need to get one of those. A quilty friend gave me a set of Alphabities as a Christmas gift. I absolutely love them. Now that I use them, I can't imagine what I did without them. I love Frixion Pens, thanks! Aurifil threads are the absolute best for piecing. It is a gray pattern. I like the ruler you use. I have one that I misplace all the time so i have gotten a couple more to have near me all the time. I just love the Frixion pens. Got one in my Sew Sampler box several more moths ago and now couldn't be without it....those things are wonderful. Aurifil Thread is my favorite notion! Ilove Frixion pens. they make marking so easy. I've always wanted a set of those Alphabitties but haven't purchased one yet. Love this pattern and all the samples I've seen from others. The frixion pens are my favorite; I just wish they would make a white one for use on very dark fabrics. Sigh. Thanks for the opportunity! I love the Alphabitties they help me stay focused and organized. Alpha bitties! I bought 2 sets and need to try em out. I love my 6 inch creative grid ruler! I use it all the time when constructing blocks, especially for paper piecing and half square triangles. Never realized how helpful the Alphabitties could be and now have 2 sets! That would be Aurifil thread of course! Love all the notions you used but my favourite has to be the Aurifil thread. I love my 6" ruler and frixion pen! Both from past Sew Sampler boxes. Notions I didn't know I needed, but now can't live without. Thanks Fat Quarter Shop. I love the aurifil thread! Frixion pens are the best! I just started using them a couple months ago and can't believe I didn't always have them. I like the little letter stickers! What a beautiful quilt! Thank you for sharing the pattern and video tutorial :) I love the Tula Pink Fabric Shears you used! I really like the alphabitties. What a great way to stay organized. Love those Frixion pens! I use them all the time. Love those frixion pens, give them to all my friends-in purple, of course! I also have a Reliable iron, best one I've ever used. I enjoy Alphabitties. They are so helpful in organizing cut pieces. The pattern is so fun! Thanks for the inspiration. Would love to try the frixion pens that were used. I am hooked on the Alphabitties and Frixion pens. They are a "must have" Thanks for the fun pattern. The Frixion pen is my favorite...or one of them! I use it all the time in my sewing room! Alphabities; absolutely! Thanks for the chance to win! I love a good pair of sewing scissors. Wonder clips ... I use them all the time on my bindings. I love that little ruler... I think it was the 2.5x6 inch one. I absolutely love the friction pens. I have a couple different colors of the pens that I use depending on the fabric that I need to draw a line on. I have even given these pens out to my sewing buddies. They are amazing. I love the Quilter's Cut and Press II mat! It's awesome!! I like the idea of the Frixon pens, never thought about the fact that it disappears after ironing, so that would make a great way to mark your 1/2 square units! Great quilt, thanks for the free pattern! I love to have a small ruler near my machine - the Creative Grids/Fat Quarter shop ruler in the video is the perfect size - might just have to have one too! i don't know what I did without my June Taylor ruler (12 X 18). Thanks for the giveaway. I love the frixon pens. I use them all the time. Enjoy your videos. I love the FriXion pen! That is the same one I use. It erases completely when I iron, no water needed. The Reliable iron would be my absolute favorite, but I do like all the notions in the video and even though it's not a notion, I really like Kim's shirt!! I will never buy another Oliso iron as mine died recently, it's still under warranty and Oliso hasn't taken responsibility on it and has been difficult and useless to deal with!!!! I like that ruler! It seems like the perfect size. Alphabities were my favorite notion from the tutorial. Although, I don't have any and still use snips of paper to do it. This would be a notion I would buy for myself. My favorite notion used in Kimberly's youtube video is definitely the Aplhabitties. They help to keep things organized. One of the best inventions ever!!! Thanks Kimberly! Love the free quilt pattern! The Frixion pens are great. All the fun of disappearing ink for adult quilters.